The dragon's heads are those of an eagle and a dragon to signify the principal occidental and oriental enemies during the Second World War. At the top, just to the right of centre are the years "1939" and "1945" in two lines. The qualifying area is defined as 66° 32’ North Latitude and the qualifying period recognises the particular severity of the conditions experienced by those who served in the Arctic. The Arctic Star is a retrospective award, coming nearly seven decades after the end of the Second World War, and was announced in late 2012. (Now Replaced By A Silver Oak Leaf). British Army - Guards - PARA - SAS - RAF - Royal Navy - Royal Marines - SBS. Africa Star Ww2 Military Medal British Commonwealth Operational Service Copy!! British Empire and Commonwealth, 1939. Anyone interested in history will love this amazing piece of art! 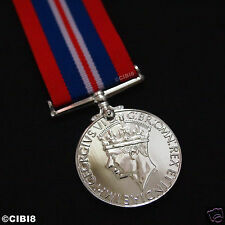 DSO Medal : Distinguished Service Order Military Decoration British Medal Repro! The order is generally given to officers in command, above the rank of captain. 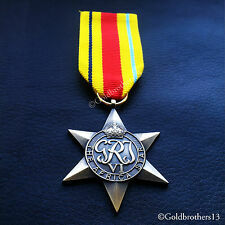 Distinguished Service Order Military Decoration of British Commonwealth Repro. (One of The Best Quality Replica on The Market). Wearing brooch is not included. 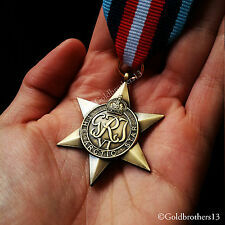 New listingPacific Star Medal WW2 British Army Commonwealth Military Medal New Repro. One full size reproduction PACIFIC STAR. High military award to subjects of the British Commonwealth who served in the Second World War, specifically in Italian Campaign from 1943 to 1945. THE MILITARY CROSS. · Military Books. · Silver War Badges. · WW1 Service Records. The order is generally given to officers in command, above the rank of captain. He had enlisted age 27, in December 1915. Battalion Lewis Gunner. Service papers for this recipient are online. "For Bravery in the field ". The origins of the earlier flag of Great Britain date back to 1606. The present design of the Union Flag dates from a Royal proclamation following the union of Great Britain and Ireland in 1801. The flag combines aspects of three older national flags: the red cross of St George of the Kingdom of England, the white saltire of St Andrew for Scotland (which two were united in the first Union Flag), and the red saltire of St Patrick to represent Ireland. The obverse has a central design of the George VI Royal Cypher "GRI VI", surmounted by a crown. A circlet, the top of which is covered by the crown, surrounds the cypher and is inscribed "THE ARCTIC STAR". 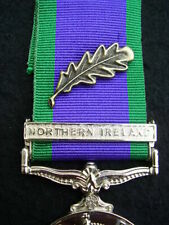 Original Ribbon with Lorraine Cross (Very hard to find).